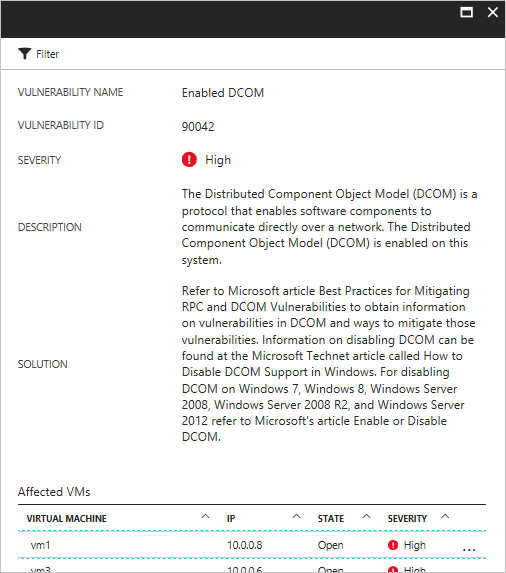 The vulnerability assessment in Azure Security Center is part of the Security Center virtual machine (VM) recommendations. If Security Center doesn't find a vulnerability assessment solution installed on your VM, it recommends that you install one. A partner agent, after being deployed, starts reporting vulnerability data to the partner’s management platform. In turn, the partner's management platform provides vulnerability and health monitoring data back to Security Center. You can quickly identify vulnerable VMs on the Security Center dashboard. Switch to the partner management console directly from Security Center for additional reports and information. Currently, vulnerability assessment is available from Qualys and Rapid7. You can install the vulnerability assessment solution on multiple VMs. The VMs must belong to the same subscription. This article introduces the vulnerability assessment service by using an example deployment. This article is not a step-by-step guide for implementing vulnerability assessment. On the Security Center dashboard, in the Overview section, click Recommendations. On the Recommendations page, select Add a vulnerability assessment solution. 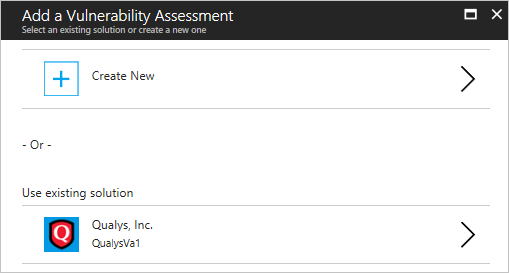 On the Add a vulnerability assessment solution page, select the VMs where you want to install the vulnerability assessment solution. You can create a new vulnerability assessment or use an existing solution. 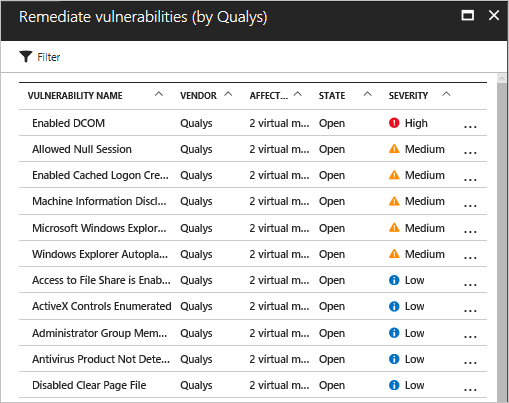 If you create a new vulnerability assessment, you can select a partner solution in the Azure Marketplace. Or, under Use existing solution, select Qualys or Rapid7. You can change auto update settings. On the Partner Solutions page, select the partner solution, and then click Configure. On the Configure security solution page, for Auto update, select ON or OFF. The following example uses Qualys. To deploy the agent from Security Center, you need a license code and public key from the vendor. To learn how to get the license code and public key, see the Qualys documentation or Rapid7 documentation. On the Create a new Vulnerability Assessment page, click the partner’s name. In this example, click Qualys. The partner’s vulnerability management page opens. The options shown on this page might change depending on the partner. For this example, select Qualys. For Resource group, select Use existing. For Location, select where the solution is geographically located. In the License code box (this is specific for Qualys), enter the license provided by the partner. In the Public key box (this is specific for Qualys), enter the public key information provided by the partner. If you want to automatically install a vulnerability assessment agent on all discovered VMs in the subscription of this Qualys solution, select the Auto update check box. After the vulnerability assessment solution is installed on the target VM, Security Center scans the VM to detect and identify system and application vulnerabilities. It might take a couple of hours for the first scan to complete. After that, it is an hourly process. Detected issues are shown under the Virtual Machines Recommendations option. The following example shows how the recommendations appear on the Recommendations page. In this example, the selected recommendation shows that the detection was performed by Qualys. If you click this recommendation, a new page appears. This list shows all vulnerabilities, in order of severity, and the number of virtual machines that are affected by each vulnerability. For this example, the vulnerability Enabled DCOM was selected. This page shows the recommended steps to take to address this vulnerability. 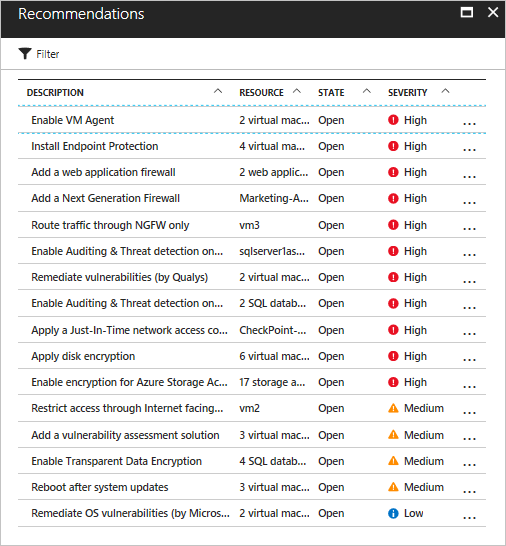 Azure Security Center planning and operations guide. Learn how to plan and understand design considerations for implementing Azure Security Center. Security health monitoring in Security Center. Learn how to monitor the health of your Azure resources. Manage and respond to security alerts in Security Center. Learn how to manage and respond to security alerts. Monitor partner solutions with Security Center. Learn how to monitor the health status of your partner solutions. Azure Security Center FAQs. Get answers to frequently asked questions about using the service. Azure Security blog. Find blog posts about Azure security and compliance.